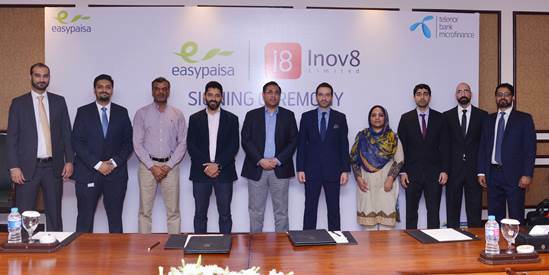 Telenor Microfinance Bank’s mobile money platform, Easypaisa, and Inov8 Limited have signed a strategic agreement to offer Easypaisa’s vast distribution network to all commercial banks who are signed up with Inov8 technology. The agreement was signed by the President & CEO Telenor Microfinance Bank, Ali Riaz Chaudhry and Co-Founder and Co-CEO Inov8 Limited Bashir Sheikh, in presence of respective management teams. Telenor Microfinance Bank & Inov8 Join Hands to Promote the Mobile Financial Services Industry. Under the agreement, Telenor Microfinance Bank has licensed Inov8 Limited’s latest financial technology product, i8 ServiceBus (i8-SB), which will allow the mobile financial services provider to integrate with all Inov8 Limited deployments, offering their industry leading agent network for use by other banking players. The first bank has already been integrated as part of the implementation with others to follow soon. Easypaisa has the largest agent network across Pakistan, while Inov8 Limited has the most widely deployed technology in the country for mobile and branchless banking, making this a natural synergy that can help the industry grow.